An investigative report, claimed to be comprehensive, says that there are breaches of labour rights, workers exposed to grave risks for their health and safety, and severe environmental pollution caused by the breaking of ships in the intertidal zone of the Alang Shipbreaking Yard in Gujarat. 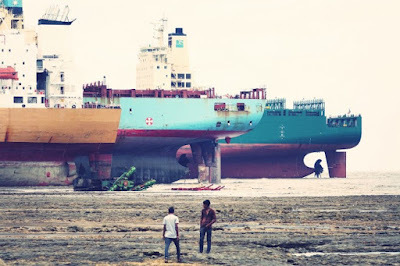 Released by “Danwatch”, a Denmark-based independent media and research centre that focuses on corporate social responsibility, human rights, environment and conflict areas, the report says that shipbreaking practices at Alang do not even remotely meet international standards. The report documents workers without contracts, who endanger their health and lives when exposed to toxic fumes, risking explosions when torch-cutting in only T-shirts. The Danish consultancy talks of “huge investments to build adequate infrastructure would be necessary in Alang”, questioning “commercial viability of investing in beaching yards, especially because some of the problems are likely to be impossible to solve in the intertidal zone”, the Platform says. ”The Danwatch revelations clearly show the wide discrepancy between the industry’s greenwashed presentation of Alang and the factual conditions in the yards”, the Platform says.